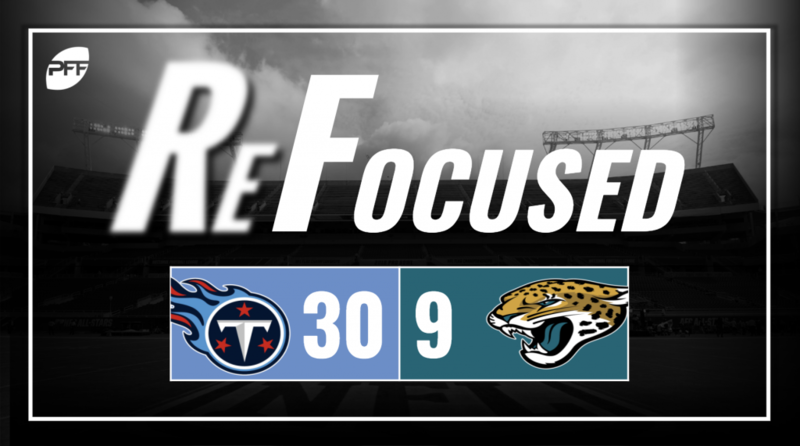 It was the Derrick Henry show for the Titans’ offense, who stiff-armed Jaguars defender after Jaguars defender into the ground on his way to 238 yards and four scores, including an incredible 99-yard touchdown in the second quarter. Tennessee didn’t need a whole lot from the passing game tonight, but Taywan Taylor was the most noteworthy player in that facet. Taylor caught six of seven targets thrown his direction and converted three first downs early in the game while it was still a contest. The Titans’ defense pressured Kessler fairly often, led by Jurrell Casey‘s two sacks, while Brian Orakpo and Jayon Brown added a handful of their own pressures, forcing Kessler out of the pocket and to throw the ball away on a couple of occasions. The Titans’ secondary was fairly effective in contesting throws down the field, directly leading to some incompletions. Adoree’ Jackson, Malcolm Butler and Kenny Vaccaro all had at least one pass breakup each on the night. It was an embarrassing tackling effort from Jacksonville’s defense, with several players missing multiple tackles and just about everyone getting in on the act, allowing Henry to pile up yards after contact. While there weren’t too many positives to take away from the Jaguars’ performance defensively, Calais Campbell was among the few players to show up as a run defender and nearly from the backside of the play to stop Henry’s long touchdown run before it could get started. Jacksonville struggled to run the ball the entire game. In his first game back from suspension, Leonard Fournette averaged just 2.6 yards per carry and finished the day with 36 yards. The run game is supposed to be the offense’s strength, yet the Jags couldn’t score on three runs with Fournette inside the three-yard line, leading to them coming up empty and a turnover on downs in the second quarter. In his second start of the season, Cody Kessler didn’t play all that bad, but it seemed like there was a clear divide in performance. In the quick passing game and when given time to throw on longer developing plays, he threw the ball pretty well. But when he was under pressure or fled the pocket, his accuracy became an issue and he made some questionable decisions. A few dropped passes certainly didn’t help, either. It was going to be tough to win heading into the game with Kessler starting just his second game and the offense continuing to struggle, but giving up 30 points was far too much to overcome.